​in our most meaningful relationships and open new possibilities?" Do you sometimes wonder if you could transform your most meaningful relationships--friends, family, partners, colleagues--into something new, something deeper, something stronger? And do you sometimes wonder what difference it could make in your life? A Harvard study of hundreds of people for more than 80 years has revealed the crucial role that good relationships play in our health and happiness. It turns out that close relationships, more than money or fame, are what keep people happy throughout their lives. The need to connect deeply in meaningful relationships is hardwired into each person, yet many of us still struggle to do so. But what if it was easy? Could there be a way to break out of our current relationship patterns? To bridge the gaps we feel and connect on a deeper level? What might happen if we explored these possibilities, together, in conversation? "How can we practice conversations that invite transformation in our most meaningful relationships and open new possibilities?" The Art of Hosting & Harvesting Conversations that Matter offers simple and powerful participatory practices, patterns and processes that enable us to listen deeply to each other and take wise action to meet our challenges. ​In this 3.5-day learning experience, participants are invited to deepen their insight into participatory leadership: they will discover and practice a set of simple yet powerful approaches for designing and facilitating powerful conversations, engagement processes and meetings. They will also learn and experience key practices and tools for collaboration, while engaging in deep conversation on the calling question above. Join Art of Hosting Vietnam 2018! 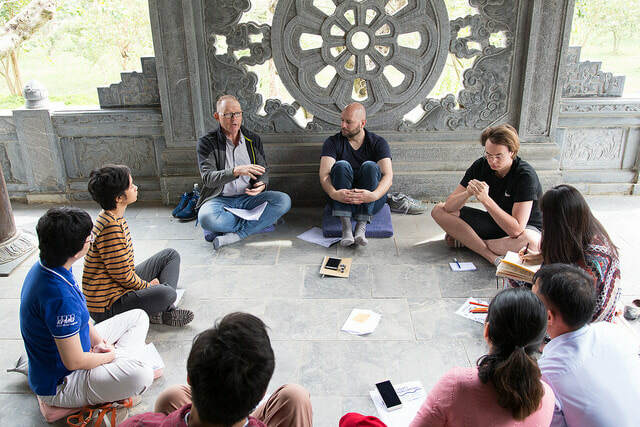 This 3-day residential training offers simple and powerful participatory practices, patterns and processes to harness the collective wisdom and self-organizing capacity of groups of any size. Participants have the opportunity to experience and practice “hosting” (facilitating) various participatory processes and methodologies. ​These methodologies are specifically designed for working with complex challenges where the solution is not obvious and the path forward is unknown, even to the leader. They help access the collective intelligence of any group, to find new solutions through creative collaboration. The invitation question will be explored during the training as the focus of each hosted conversation. Deepen your insight into participatory leadership and working with emergence and complexity. Learn ways to create and hold spaces where people are invited to unlock their full potential and make valuable contributions. Practise a set of simple yet powerful approaches for designing and hosting (facilitating) powerful conversations, engagement processes and meetings. 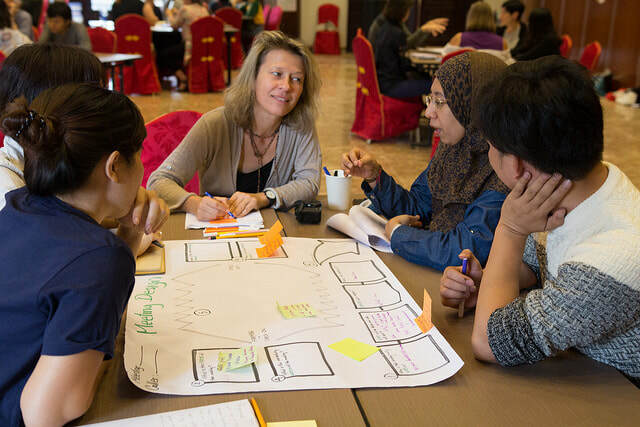 Learn and experience key practices and tools for collaboration such as Appreciative Inquiry, World Cafe, Open Space, Collective Story Harvesting, Circle Practice and Designing for Wiser Action. We will also learn about practices, concepts and methodologies such as next stage or ‘Teal’ organisations, Theory U and more. Discover the Art of Harvesting - visually capturing and making sense of meetings and conversations for clarity, learning, growth and wise action. "Tell me and I forget. Teach me and I may remember. Involve me and I will learn." "Offer what you can, and ask for what you need"
With this principle in mind we have tried to set up the economy in a way that allows for radical inclusion, generosity and transparency. As Art of Hosting is not only about how to work together, but also about art of conversations and art of living, we are always ready to share our stories and listen to yours. Feel free to contact the TEAM if you have any question or comment.